The orangey red backdrop of this pastel drawing of Boaz and Ruth in a field between ears of wheat suggests the radiant fire of Pentecost. The bright colours fill me with a feeling of celebration. No wonder, as the story the drawing is telling belongs to a feast: the Feast of Weeks or Shavoe’ot, the Hebrew feast underlying the Christian feast of Pentecost. The waving grain alludes to this time of observance, which takes place at the end of the barley harvest and the beginning of the wheat harvest. From far and near the Israelites streamed as pilgrims to Jerusalem to offer the first-fruits of the harvest to God – exactly seven weeks after Pesach (Passover), on the fiftieth day (‘pentèkostè’ meaning fifty in Greek). This feast also celebrates the gift of the Torah or Law to Moses, which according to tradition he received on the fiftieth day after the exodus out of Egypt by the people of Israel. It was during this feast that the Spirit of God descended on the disciples of Jesus with tongues of fire in a sudden gust of wind, just like God once descended on Mount Sinai with the sound of trumpets in a red glow of fire. During the Feast of Weeks the Ten Commandments and the story of Ruth are read during services in the synagogue, the latter as a special festival scroll. The garment that Boaz is wearing in the drawing also belongs to a feast: white with black. With the Maasai people in Tanzania, for whom Karin Kraus made a series of drawings based on the stories of the Bible, colours have important symbolical meanings. White is the colour of purity and black is the holy colour of celebration. Boaz towers over Ruth while he puts his arm around her. With his face all flushed it looks like he is about to make a solemn proposal. Ruth raises her head towards him with an expectant, even somewhat reserved look in her eyes. When I looked more closely at this picture, I was suddenly struck by the black shadow at her left side and how her right arm reaches like that of a hungering child for the ears of wheat at the left. From there, along her arm and the black underside of the stalks, an invisible dividing line emerges that seems to separate them into two camps. Maybe the drawing is less festive than I thought after all? In the biblical text Ruth is continually called ‘the Moabite.’ In this way she is labelled an unwanted foreigner. Her people were considered enemies of Israel. Up until the tenth generation no Moabite was allowed to enter the congregation of God, as they had violated the nomadic guest right by not coming to the Israelites with bread and water when they journeyed through the desert. This woman breaks through this long enmity between these two peoples by letting her heart speak. When after the loss of her husband and children in Moab her mother-in-law, Naomi, wants to return to her birthplace in Israel to die there, Ruth refuses to let her go by herself. ‘The faithful one,’ is the meaning of Ruth’s name. However dark her path may turn out to be, she will go with Naomi, if necessary to meet her own death. ‘So the two of them went on’ (Ruth 1:19). Ruth’s goodness transcends her desire for her own happiness and in this way she fulfils the heart of the Torah. Is this what Boaz wants to make clear to her by putting his arm around her right across the dividing line? He sees in Ruth a woman who acts in the spirit of Abraham and gives her a place amongst the mothers of Israel. With the Maasai red is the colour of new life. The sky surrounding Boaz and Ruth is a bright orangey red. Their child, Obed, will become the grandfather of king David, out of whom the Messiah will be born. The ears of wheat point to the four ends of the earth. God’s salvation is without frontiers. His Spirit suffuses all of the world with the radiance of Pentecost. 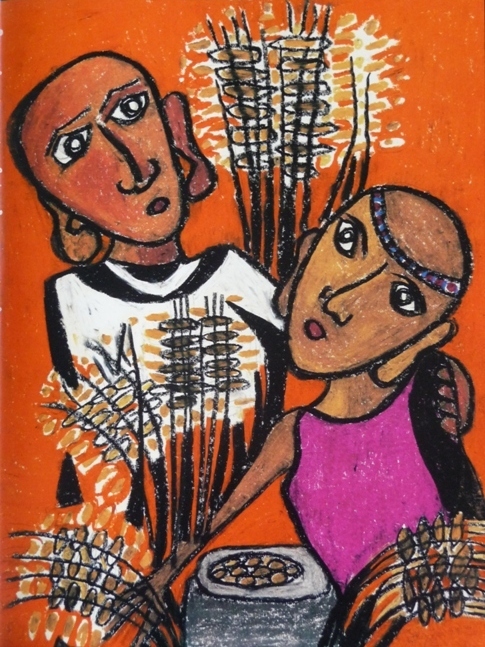 Karin Kraus: Boaz en Ruth, 29 x 39 cm, pastel drawing in the Masai-Bijbel, Standaard Uitgeverij – Antwerp, 1987; Die Massai-Bibel, Belser Verlag - Zürich Stuttgart, 1985; La Bibbia Masai, Jaca Book – Milano, 1985. Sister Katharina Gabriela Kraus also known as Karin Kraus (b. 1941 in Gimmeldingen near Neustadt, Germany) lives and works as a veterinarian and Benedictine missionary with the Maasai, an ethnic group of semi-nomadic people located in East Africa. Tall in stature and self-confident, the Maasai move around with their big herds of cattle in the steppe of Kenya and Tanzania. For them Sister Karin Kraus made the 70 images in pastel of biblical scenes that were brought together in the Maasai-Bible in 1985/1987 (German/Italian/Dutch). The lifestyle and faith of the Maasai are remarkably like those of the old people of Israel, that we know through the stories of the patriarchs. Just like Abraham, Isaac and Jacob they are nomadic shepherds with large herds of cattle. They worship only one God, Engai. He is the one, almighty and all-knowing Spirit, without body or human form. He is the creator of all that lives. It is quite exceptional that they do not worship their ancestors. According to tradition they come originally from the north. Due to lack of space and grass they kept on moving further southwards. They had been shepherds of the pharaohs and journeyed through Egypt, Sudan and Ethiopia until they found large grazing areas for their cattle in Kenya and Tanzania. According to some ethnologists their origin lies on the Arabic peninsula. Conjecturally they originally were Semites, just like the Israelites. As the similarities with the world of Abraham were apparent to Karin Kraus, she tied in with the biblical stories of the patriarchs. And as she did not speak the language of the Maasai very well, she made pastel drawings that portrayed the stories in the context and colours of the Maasai. Black, for instance, is a holy colour and the colour belonging to sacred festivals. Red is the colour of youth and masculinity. White is the colour of purity and repentance. Next she moved on to stories in the New Testament such as the parables of the Good Shepherd and the Good Samaritan. Printed in postcard format they played an important role in the catechism lessons at her mission post. In September 1982 Karin Kraus took part in a mission conference in Nairobi about mission to nomadic tribes. There she was asked to make her images also available to the neighbouring countries. In this way a collection was put together of 70 big plates printed on cardboard. Thus a great number of tribes in East Africa could be reached. José Verheule (Zaandam) is a theologian. Before her retirement she worked as a minister in the Protestant Church in the Netherlands.